St. Mary's and All Saints church was built in 1877. 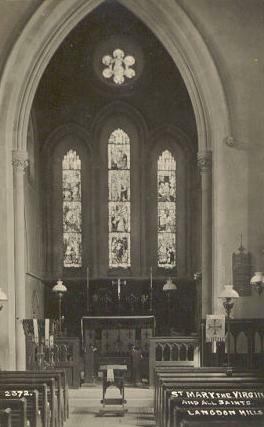 It was built to replace the church of St. Mary's & All Saints in Old Church Hill. That church is now a private residence having become redundant in October 1971. The new church, situated in the High Road at the summit of Crown Hill, was far more accessible and remains a prominent feature in the local landscape. During 1972 the bells remained silent following a survey of the tower which required restoration work. The Rector, Rev. David Cook organised a restoration fund to raise £5,000 towards the repair work. The church is now a Grade II listed building. (1) The church received listed status on 20th July 1995. Text researched and written by William Cox, 2004. Copyright © 2004, B. Cox - Basildon History Online. All rights reserved.